Have you decided what form you'd like your charm quilt to take?? Started pulling some fabrics to cut into and get plastered on your design wall? This post will give a few pointers on techniques for slicing just a little bit from a whole lot of different fabrics. I'll start by making the assumption that there's no need for me to go over rotary cutting for squares or rectangles. Chances are, if you're a blog-reading quilter, you've got that one down. So let's jump to triangles. For 60° (equilateral) triangles I use either my 6" x 12" Omnigrid ruler or the handy-dandy Clearview Triangle 60° tool by Sarah Nephew. These same tools can help for cutting parallelograms as well. Those angle markings are great for this, but just be sure you're measuring from the correct side of the ruler — it does sometimes make a difference. Below is a quick look at cutting a triangle using the standard rectangular rotary ruler, followed by the super-easy demo with the triangle ruler. My goal triangles are cut at 6" tall (convenient with the Omnigrid 6" wide rulers, but I could have gone smaller or bigger, just takes a bit more math). To start, I tested against my gridded cutting mat to see what the base length would be if I go with a triangle the size I was considering; turns out it would be 7". When the 60° line is placed along the "base" or outer edge, you can see that the length ends up at the 7" mark on the mat. Again, this is assuming I am cutting the exact width of the 6" ruler. If you want 4" instead, move the ruler so that where the 60° line and the 2"/4" line connect matches the corner at 0 on the cutting mat. Your base will be the length to the edge f the ruler just as in this photo it hits at the 7 on the cutting mat. So then I cut a 6"x 7" rectangle from my fabric. Place the 60° line across the 7" base of the rectangle from one corner to the center of the opposite side and cut along the edge. Then I flipped the piece of fabric once clockwise, placed the same 60° line along the newly cut edge, so the edge of the ruler should meet to opposite corner. If you have the tool below (or something comparable) it's easier to cut just a single piece from your fabric stash without cutting out a rectangular piece from it first. On this ruler, the number at the base is actually the height of the triangle, so if you are going for 6" tall, as I am, use the line for 6. For anything more complex I move directly to templates. For drawing your own, you can use a mid-weight to heavy card stock, mat board, or a thin template plastic, plus a ruler, pencil and Sharpie. When drawing a template, I prefer to start by drawing the size I want the finished piece to be, then add the 1/4" seam allowance guide around it before cutting out the template. It just helps me envision things better if I can see the outline of my goal. Here are some tips on how I approach this step. Above is a selection of some of the options for shapes and orientations of similar shapes that can be done by making your own template. Tall isosceles triangles (2 sides same length, 1 side different), or various trapezoids, either squat or slim and tall, for instance. I mark the outside points, as well as the mid-point on the line. Next, I choose what height I want it to be, and measure straight up from the mid-point, perpendicular to the first line. In this case I chose to also have it 4" tall. And it seemed to be a pleasant proportion to make the top of the trapezoid 2" wide, which means taking that mid-point marking and extending a line 1" in each direction. Sorry for the terrible lighting and shadow on these photos.., hopefully the lines are clear enough to see! And then it's just a matter of connecting the dots! And don't forget to add your 1/4" seam allowances before cutting out your template!! In theory, you should be able to take the principles of how I drafted this template and apply to most one-patch-friendly shapes. The measurements can be relatively arbitrary as long as they are consistent and the angles fit together when pieced side by side. 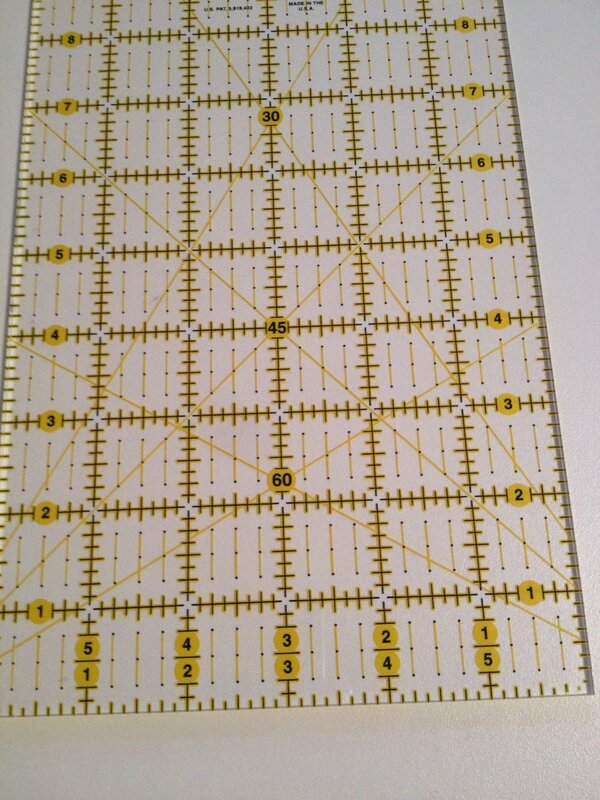 This template can now be used as a marking gauge for all of your fabrics. I alternate between my ceramic chalk mechanical pencil (for darker fabrics), a water-soluble blue marking pen, or for this purpose, since we're marking our actual cutting line, even a permanent Sigma Micron pen works well. Whew! That's a lot of photos for something that hopefully isn't all that complicated! So, let's get to this! In the next week or two let's see if we can get a minimum of 40 patches cut out. If you're confident with starting to piece them together and want to jump in there, be my guest, though there will be updates along the way to go step-by-step for that. Leave a comment below, post to instagram using our #yacqal hashtag and let's see what everyone has decided to make!! I can't wait to see all of the fun, different tastes!! You're a Charm Quilt-Along — Let's Begin!